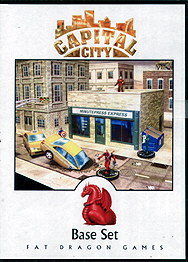 Capital City brings a visually stunning urban environment to your tabletop. Everything you need to create a dynamic city is included in this set, from streets and cars to buildings and all the accessories you've come to expect from FDG. Most files include user selectable graphic options, allowing you to customize your city your way. This set also includes support for 1" grid, 1.5" grid (clix miniature games), no grid, and 1" hexagons. User selectable graphics include pot holes, police tape, broken and boarded up windows, litter, body out-lines (including super villain themed), various weathering effects, building details and colour options, bird poop and much more!